A straphanger's diary of the ridiculous happenings aboard the A train. A circus of entertainment for only $2.50! How about a musical interlude! I walked right into a music performance on the A train this evening. Four young African American dudes. One played an acoustic guitar, one played a trumpet (!) and the other two guys did vocals/collected donations. They were actually pretty decent. Like a hip hop mariachi sound with poetic lyrics. When we pulled into the Fulton station even the band playing on the platform stopped their performance (drummer and saxophonist) and came over to applaud the guys on the train. Before they got off, one of the vocalists said to look them up online. But I heard him say the name of the band is "soldier life" and I can't seem to find any of their music online. Too bad they didn't have cards. Witnessed a crime today. The train pulled into a station and, while the doors were still open, a woman ran by shrieking at the top of her lungs, "That fucker stole my phone right out of my hand!" People looked on and, in typical New York fashion, did nothing. Oh well. Rode on the train with Charles Barkley this afternoon. He got on at Canal Street with two security people. Several passengers started taking photos discreetly. He got off at Chambers Street. Wtf? Just need to say... There are just TWO line items. I don't think we need the arriving trains to be numbered! It is not a list. It ends up looking like 14 and 34 since the trains are numbered. I care about the time of arrival not the order in which the trains arrive. Why complicate it when the whole point of having a digital sign is to simplify things? I just bumped into a guy wearing a backpack that had a hammer dangling from the side pocket. Reminded me of the time I saw a trio of guys on the A train: One guy had a crow bar, another had a screwdriver and the third held an ice pick. 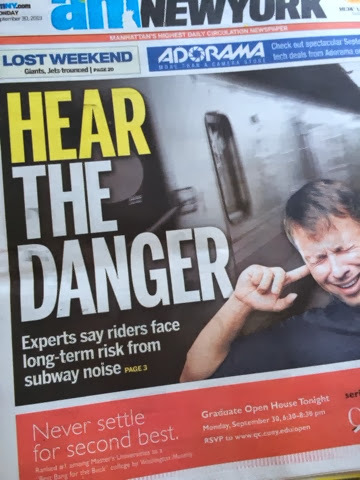 It was one of the few times I actually felt fear while riding the train. Gotta watch your back on the A! This morning the A train was so out of control that it actually gave me motion sickness. 1. A bear with aviator sunglasses wearing a green utility jumpsuit and a very, very low-cut wife beater shirt with lots of chest hair. 2. An older Chinese lady with a black sporty backpack that has two giant okra poking out. This afternoon a middle-age thuggish guy* came zig-zagging through the train car spouting some preachy advice for us all. "The devil made me smoke weed." "It was the devil that made me a hater. I hated on everyone. The only way through is with god on your side." "I ain't gonna steal your watch or your phone. Life's got a bigger purpose than that, folks." I looked into his eyes and he seemed genuinely sincere. Not crazy. Just trying to help us all be a little bit more kind and considerate. *A reformed guy formerly known as a thug. I'm pretty sure that the tattoo tears near his eye represent gang kills. 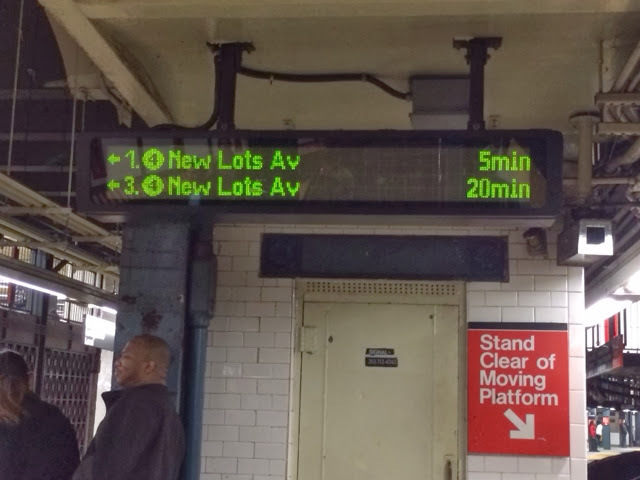 Waited ten minutes for an A or C train while three F trains showed up across the platform during that time. The lady conductor screamed,"STAND CLEAR OF THE CLOSING DOORS...STOP BLOCKING THE DOORS! STAAAAND CLEEEAAAR!!!" This happened at each station. A woman next to me had on a giant backpack despite the train car being very crowded. Clearly not a New Yorker. Or just really inconsiderate. The train wildly jerked back and forth between High Street and Fulton Street. I wonder why this happens. Are the tracks not aligned? This morning there was about thirty square feet of super-sticky grossness on the floor of the A train. Everyone's shoes were sticking, but the train was so crowded--at 7am mind you--that no one could move to a different area of the car. 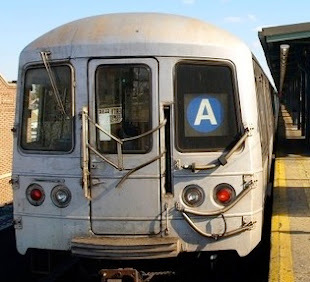 Which is unfortunate for A and C train riders because the old, rickety cars have little to no sound insulation. The C is so loud that you can't hear music on your headphones. A shiny new C train showed up this morning! It was so new that the digital train line station map on the inside of the car was entirely digital. 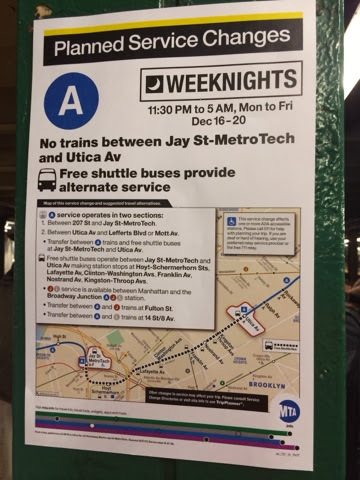 None of that "2 train running as a 4" nonsense. The lighting just made it feel fresh, crisp and upbeat. My commute was a happy one. Hope this is a sign of things to come. The C is the oldest train in the system (from the 1960s). The A literally knocked the wind out of me this evening. I was standing and leaning up against the doors (the less I touch, the better) when a sudden jerk threw me forward and back. The cars are so filthy that I hesitate to hold on to polls unless necessary. Same thing happened two days in a row. Frantic tourist on train: Does this train go to the JFK? Passenger 1: Um, yeah, no, maybe. Passenger 2: Well it depends. You need a far rockaway bound A train. Not a lefferts boulevard A train. Passenger looks for a digital display on the inside of the car. There is only one and it glows a sickly green-yellow. No words are displayed on it. Passenger: Guess you'll find out. Jay Street Station. Woman on train platform. A train has arrived. It is extremely crowded. Woman: Is this going to the airport? It doesn't say on the outside. I asked an elderly woman if she wanted my seat and she gratefully gave the seat to her husband who had a cane. Across the car another woman stood up and asked if the elderly woman wanted her seat. A few minutes later I heard the elderly woman murmur, "there are still nice people in this world." I couldn't help but roll the familiar MTA loudspeaker announcement, "courtesy is contagious...", in my head. Like a shrub in the forest, I stood in the middle of the train car surrounded by three women and two men who were all six feet tall. People with giant strollers should not ride the train at rush hour. This morning I am sitting in the front corner of a train car. It smells horrific, like a wet dog, but I can't see any homeless people in the vicinity. It could be lingering air pollution from a homeless guy, in which case I am disgusted by the possibility that the culprit sat--or worse, slept!--where I am sitting now. Two hours of my day are spent aboard the A train for my commute to and from work. There are so many ridiculous sights, sounds, and smells that I felt compelled to dedicate a blog to this experience. A typical type of train on the A line is the R32, which was built in 1964-65. They are the oldest cars in the system. The A and the AA were the first services in the IND Eighth Avenue Line when it opened in 1932. Identity crisis: the AA was renamed the K in 1985 and in 1989 it was replaced by the C.
Art and design are my passions. I enjoy drawing, painting, hand-lettering and graphic design. The views expressed here do not represent any organizations or institutions with which the author is affiliated.